This blog is the fifth in a series of posts about Mongolia’s 2016 parliamentary elections that were held on June 29th. Mongolia’s June 29th national parliamentary elections and Ulaanbaatar city elections acted as a multifaceted anticipatory device. The elections could be said to form a symbolically cumulative conclusion to a troubled political and economic period. The result was a vast overhaul of the state hural and the winning of an 85.5% majority for the Mongolian People’s Party (MPP). However, looking deeper into the temporal flow of the pre-election and post-election period reveals not so much a culminating electoral event and political regime change at the national and city levels. Instead, for many people living in Ulaanbaatar, this year has proven to be one of ongoing waiting and uncertainty. This period has been punctuated by waves of speculation and markers in time that produce stalling caused by changing groups of the political class. 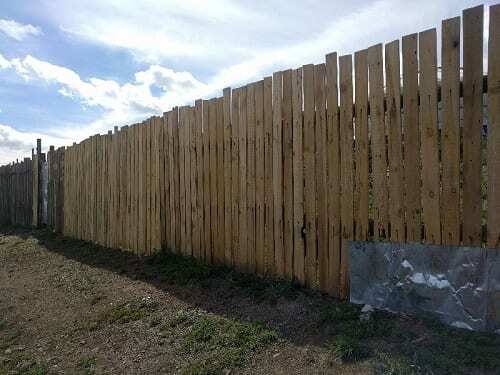 Image 1: A new fence has been set up on a plot of land. One group of people in Ulaanbaatar have been particularly hit by post-election stalling. Again, their story began a long time before this year’s elections. 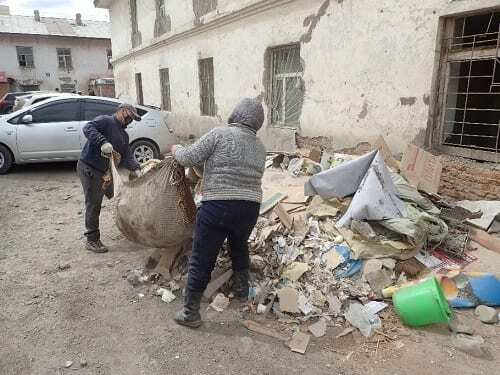 They are a people who have been left behind after the last economic peak of 2011 and have borne the brunt of the subsequent departure of major investment from Ulaanbaatar’s construction sector. In the heart of Zuun Ail, an area close to the city core and a prime area for redevelopment projects, lies a collection of old niitiin bair – former construction worker dormitories built during the 1950s. Building No. 3, like the other niitiin bair, stands as a two story building that consists of one room apartments. These buildings have never had running water, and residents obtain their water from nearby wells. The one advantage these buildings had was heating. In the earlier days of the rise in construction development a construction company sought to redevelop these buildings into apartments. Excited at the prospects of gaining access to better infrastructure including running water, and increasing the value of their property, many owners in Building No. 3 signed contracts with the company to exchange their apartments for new ones to be built in their place. Unfortunately, funding dried up, the redevelopment of Building No. 3 did not go ahead and the construction company is rumoured to have gone bankrupt. [ii] Before this was known however, the internal infrastructure of several of the rooms were removed, including the heating pipes, windows, doors and floor boards which were sold for scrap. Several different parties are blamed for this, including some residents claiming that owners were told to remove the infrastructure to display intent to leave and compliance with the upcoming redevelopment. Since then, the rooms have been further vandalised. The end result has been that multiple apartments on the bottom floor of the building have been slowly filled with refuse, as rubbish has been routinely disposed of through the gaping holes of former windows over the course of some time. The building’s heating has been switched off, the building itself is in a crumbling state of disrepair and is unsafe to live in. Image 2: Many of the building’s lower floor windows have been removed and rubbish thrown in anonymously over time under the cover of darkness. 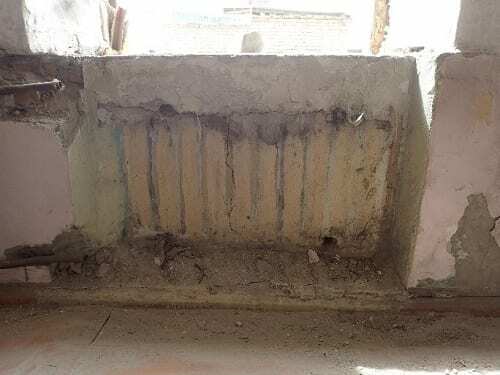 Image 3: An abandoned room in which the radiator and window have been removed. Several people still live in this building and are unable to leave. Many owners, both living in the building and elsewhere, are desperate to find a solution to their problem – to find a different construction company deal, to receive compensation from the original construction company, or to simply find alternative housing. However, since the election period, simply being provided emergency alternative housing has become a main and urgent aim. Those still living in the apartment are working to a strict and unforgiving deadline: the looming onset of winter in an unsafe apartment building without heating. 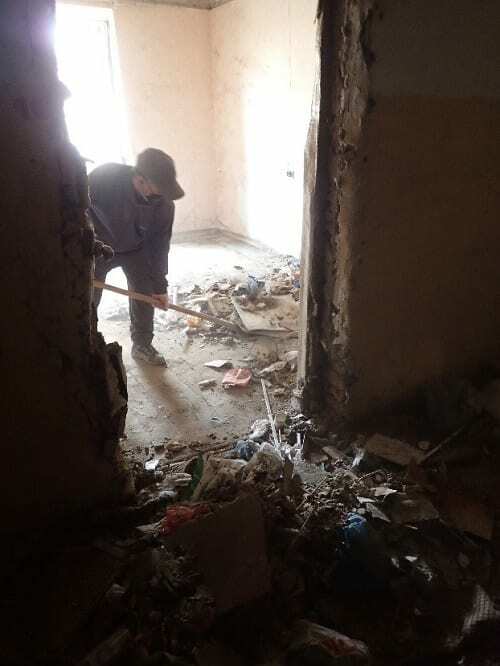 The situation is dire and resulted in Amnesty International Mongolia putting a call out to campaign for the former Ulaanbaatar mayor Bat-Üül to provide these people with alternative housing. This Amnesty International call-out has since been renewed and rebroadcasted since the elections. During the elections, election promises were made offering some solutions. This has meant that for these people, the elections acted as an important anticipatory device. However, as yet, the residents have not yet been provided alternative housing and cold weather is fast approaching. For the resident owners, this prolonged period of waiting has been a time of strategy, observation and flows of different types of actions. Just as the political stalling is prolonged and ongoing, so too are their different types of strategies. Here attempted ‘resolution’ of their situation, rather than an end point, is a maintaining device and important way to be heard. Residents have been involved in different court cases related to their situation. Much time is spent commenting on the ongoing situation while sitting in doorways of buildings and on the street, where updates are shared, compared and critiqued. They display an ‘active interaction’ between resistance and attempts to bring about change, while staving off the material flow-on effects of forced disrepair (Ortner 2016). Image 4: An apartment owner cleans out the accumulated and decayed rubbish of an empty apartment in the lower floor of the building. Image 5: On May 22nd 2016 residents removed the rubbish from Building No. 3. Thanks to their amazing efforts, the rooms are now cleared. But the building’s current residents continue to wait. They plan to have everyone move upstairs, then seal off the corridors and the windows of the ground floor to stop further rubbish polluting their building. In this period of waiting, their only option is to carve out a better space and modify this building to their needs. However, in the last few weeks, residents have informed me that people are beginning again to throw rubbish into the building during the night. The promise of varying forms of assistance for residents of Building No. 3 is an election promise of severe personal, emotional weight. Providing emergency alternative housing can determine the health and well-being of a large group of people this coming winter. While some steps by new politicians have been taken since the election, alternative housing has yet to be confirmed. The failure to provide such housing puts these people into a dire and unknowable situation and has considerable material and felt ramifications. Bureaucratic stalling in Ulaanbaatar at the height of summer was always going to have significant effects reverberating throughout the city. A land official told me, “it is normal for this [kind of stalling] to happen during an election year.” It is common for a new term of Mongolian national parliament to not be confirmed until September of that year. However, as Mongolia’s new politicians are aware, Mongolia’s recent economic oscillations mean that this year is no ‘normal’ election year. To address the looming decisions, the new state parliament was formed much quicker than usual. What was described as a crisis in the lead up to the election has transformed to ever deepening gradations of ‘crisis levels’ without a clear end in sight. The course that Mongolia now needs to take given the government’s own economic assessment is by no means clear. Mongolia faces major economic decisions that, no matter which way they turn, will have significant geopolitical consequences. Mongolia is currently considering accepting IMF bailouts, while the Bank of China has set up an office in Ulaanbaatar, and waits to see whether Mongolia will open its economic borders to allow it to set up branches and commence operations in Mongolia. While bureaucratic stalling is common during an election year, acts of stalling this year are especially critical given the far-reaching economic fallout that has affected so many groups of people. However, where there is stalling, there are also new possibilities. While people wait to see whether this ‘crisis ordinary’ (Berlant 2011:10 c.f. Rebecca Empson this blog series) will deepen into a chasm of economic disrepair that the country as yet cannot see an end to, some people see this interlude as the opportunity to divert their current course. Let’s just hope that the new political representatives of Zuun Ail at the city and national level will find ways to manoeuvre their newly acquired power to allow the residents of Building No. 3 to access alternative housing this winter. These are one group of people who simply cannot afford to wait. A sincere thank you to Doljinsuren and Erdenezayar for assistance with this research. [i] Living on land as a way to ‘hold’ and prevent others from claiming it has long been a part of land access in Ulaanbaatar since 1990. 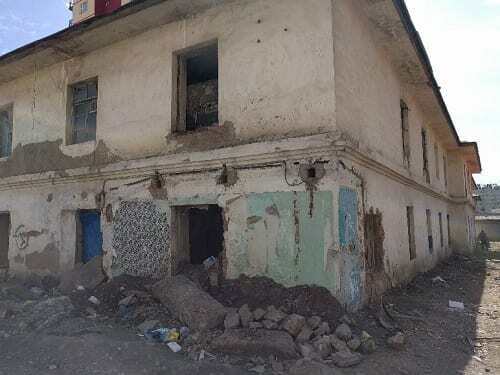 [ii] While conducting research on property in Ulaanbaatar, more stories emerged of other similar failed redevelopments of other buildings in different areas of the city. This blog is the fourth in a series of posts about Mongolia’s 2016 parliamentary elections that were held on June 29th. Lauren Bonilla and Tuya Shagdar co-authored this blog. It is based on our collaborative research on the social life of political gifts and cash transfers in the Mongolian economy. We are currently writing a larger journal article on this topic and will present our research at the Emerging Subjects project workshop to be held at the National University of Mongolia on November 15th, 2016. According to Mongolia’s election law, parliamentary candidates are permitted only 18 days to campaign prior to the day before Election Day. A short campaign period is meant, in theory, to curb excessive campaign spending and reduce the pre-election politicking fatigue of citizens. In practice, however, the campaign season extends well before the 18 days. For months before the parliamentary election, aspiring candidates employ an array of novel and costly tactics to attract public attention and support, notably though the giving of gifts. 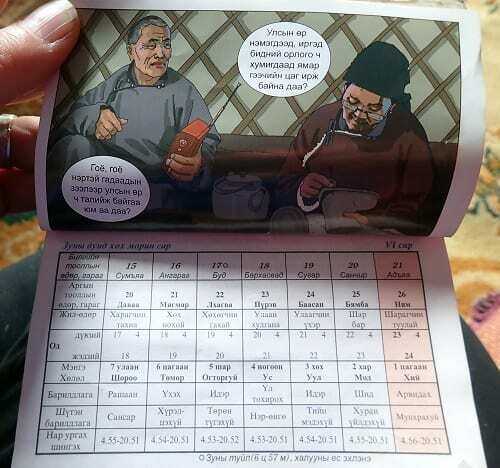 In May, we (Tuya Shagdar and Lauren Bonilla) travelled to the geographic fringe of Mongolia in north-western Uvs province to study parliamentary election politics and rumours of gift-gifting before the official campaign period was set to begin. It was a heated time for us to be doing research on the elections. We learned this immediately when we arrived in the capital of Uvs, Ulaangom. When we attempted to snap photos of the Democratic Party (DP) headquarters and the fleet of slick black Land Cruisers parked outside of it, a man in his twenties working for the party ran towards us and aggressively questioned what we were doing. After warning us not to take photos and calming down a bit, he said to us, “You know what kind of period it is, right?” (Yamar uye baigaag medej baigaa biz dee). 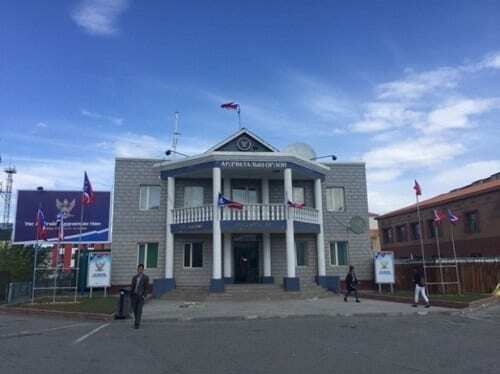 Democratic Party (DP) Headquarters in Ulaangom, Uvs. Photo by Tuya Shagdar. Actually, for many people in Uvs the heat of the elections began to blaze after the beginning of the fire monkey lunar year in February. Astrologists predicted that it was going to be one of the coldest and snowiest winters in Mongolia’s recent history, and this turned out to be true in Uvs. Herders struggled to keep livestock alive as temperatures dropped below 40 degrees Celsius and deep snow prevented livestock from accessing pasture. The physical, psychological, and financial effects of the harsh weather event, known as a dzud, were compounded by the absence of cash following a season of poor meat sales. This difficult period provided an opening for aspiring parliamentary candidates to strategically make themselves known to both voters and to the political party they sought a nomination. Everyone we talked with in Ulaangom and a rural district in Uvs, Bokhmoron, talked about the “assistance” (tuslamj) that they or people in other districts received from individuals vying for a position a parliament. The assistance families received was more than mere aid. Take, for instance, the packages that Odongiin Tsogtgerel of the Teso Group distributed throughout rural Uvs. Teso is a nationally-recognized food import and manufacturing company named after a district in Uvs (Tes) and run by a family originally from there. The company distributed an estimated 30,000 MNT (around USD $13) worth of prepacked noodles and rice to households throughout the province. On a number of occasions families hosting us prepared soups using the Teso products they received. Perhaps they valued the food items and reserved them for special guests, or maybe they thought that we, unlike them, would actually enjoy eating carrot-infused processed noodles. 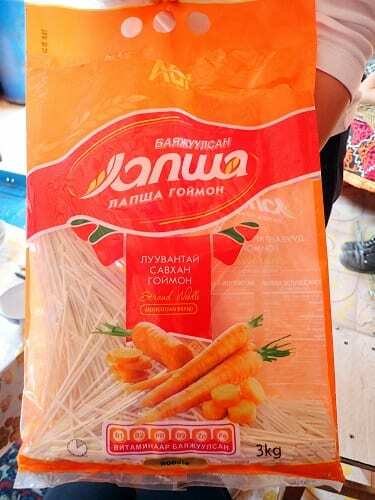 Teso’s AGI brand carrot-infused Lapsha noodles given as part of the dzud assistance package. Photo by Lauren Bonilla. 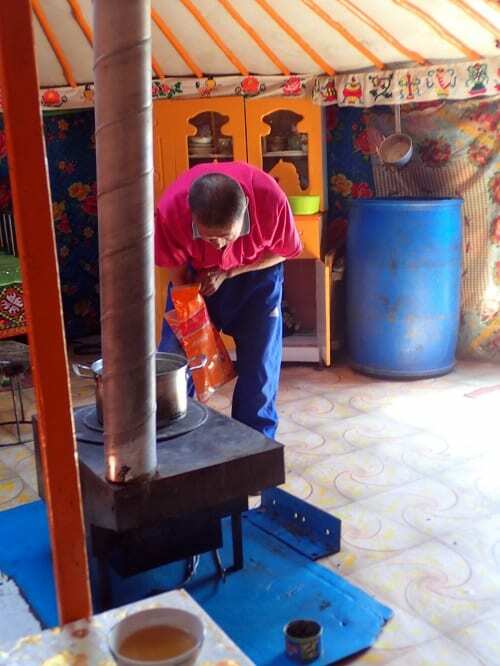 Man in Bokhmoron making us soup with the noodles he received in his dzud assistance package, even though he is not a herder who lost animals during the harsh winter. Photo by Lauren Bonilla. 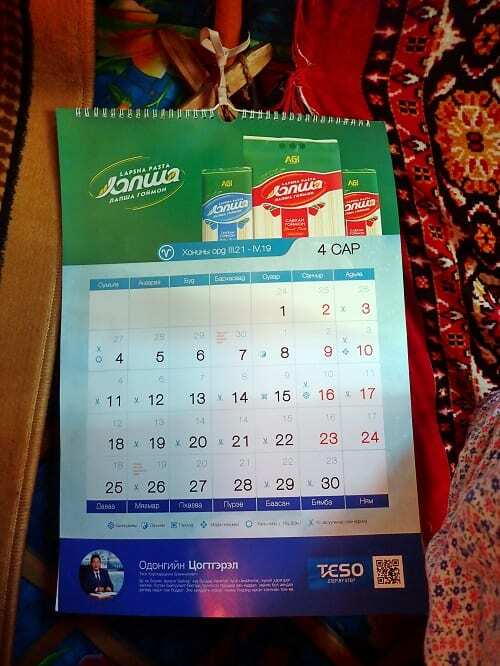 Just as every household had a bag of Teso foodstuffs from the assistance package in their cupboard, they also all had a Teso calendar hanging in their home. The calendar came with the package and promoted the Teso brand. Each month featured a different Teso business venture like imported Russian ice cream and mine drilling. The bottom of every page featured the image and profile of the President of the company, Odongiin Tsogtgerel. In May, the DP publically announced Tsogtgerel as one of its two parliamentary candidates for Uvs. Teso calendar given as part of the dzud assistance package. April features the Lapsha noodle products given to households in Uvs. Photo by Lauren Bonilla. Ondongiin Tsogtgerel, President of Teso Corporation: “In general if you are an entrepreneur who has new ideas to provide to the needs of others and if you are enjoying the work you do, the money will follow through. This is what I inherited from our father.” Photo by Lauren Bonilla. Including a calendar in the assistance package many months prior to being publicly announced as a candidate was a clever way for a businessman to promote his name and company to voters. Though the package made no reference to his political campaign or politics in general, it was absolutely a form of pre-election campaigning. Indeed, people talked about the assistance packages as gifted by Tsogtgerel, not the Teso Corporation. People appreciated that Tsogtgerel distributed the packages at the end of a harsh winter when herders were tired and low on cash to buy food staples. The packages also influenced the way that people viewed Tsogtgerel’s character. Despite his young age, the packages demonstrated that he was a “big man” (tom hun) who “does a lot of things” (ih yum hiisen). As Liz Fox described in her recent blog post, The Road to Power, being someone who has done something, not someone who says they will do something, matters greatly to Mongolians nowadays. People have become tired of promises and politicians talking about the future when so many expectations have failed to materialize. Material things – gifts – demonstrate the capabilities of a person and their potential as a political candidate. While the western calendar gifted by Tsogtgerel decorated the walls of gers, families also kept an astrological lunar calendar underneath poles holding up the ger ceiling, allowing for easy access. These small calendars are ubiquitous in the countryside and are used daily to aid decision-making about things like when to move to new pastures, make important purchases, or get a haircut. During an afternoon lull in a family’s ger in Bokhmoron, we idly flipped through an astrological calendar, not expecting to find anything related to our research. Yet, interspersing pages about earth elements, animal days, and moon phases were political comics and commentary lambasting the last four years under the DP’s leadership. The calendar was published by a an incumbent member of Parliament belonging to the Mongolian People’s Party (MPP), Chimediin Hurelbaatar. 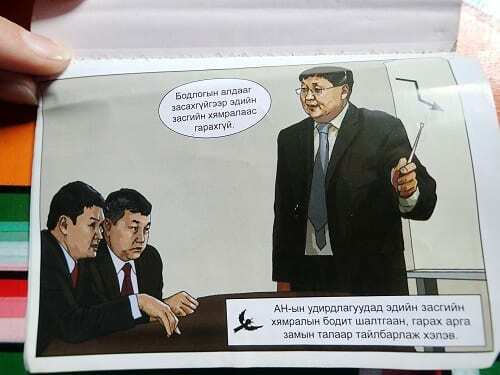 One of the comics depicts Hurelbaatar standing in front of seated leaders of the DP, holding a pointer to a graph and lecturing. The graph shows a sharply falling line meant to represent the downward trend of Mongolia’s economy. Hurelbaatar is shown as an MPP master teaching DP pupils that, “Without fixing policy mistakes we will not come out of the economic crisis”. The comic is also meant to recall lessons from Mongolia’s previous debt history. Hurelbaatar was one of the architects of Mongolia’s resettlement of its socialist-era Great Debt (Ikh Ör) with Russia, an event lauded as the MPP’s historic merit to the Mongolian economy. Hurelbaatar’s depictions of a collapsing economy resonated with pre-election discourses about an economic crisis and rising sovereign debt burdens. He presents himself in the astrological calendar as an economic pedagogue backed by experience to address Mongolia’s major issues. An image in the astrological calendar of Chimediin Hurelbaatar schooling the DP leaders about the economic crisis. Photo by Lauren Bonilla. 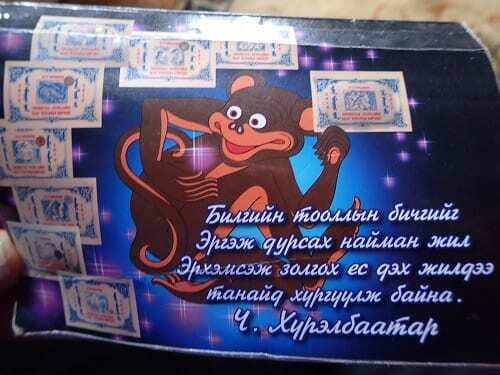 Back page of the astrological calendar distributed by Hurelbaatar for the New Lunar Year of the Fire Monkey. Photo by Lauren Bonilla. Astrological calendar detailing animal days and earth elements, as well as commentary about national external debt. Photo by Lauren Bonilla. Like Tsogtgerel, Hurelbaatar distributed the astrological calendar as a gift to families after the Lunar New Year holiday in February. Both calendars served the same function to make the potential candidate’s name and face visible to people. However, Hurelbaatar’s astrological calendar appealed to more traditional sentiments and a past when the economy was stronger under MPP leadership. It also had direct political messaging, without specific mention of Hurelbaatar’s aspirations for another run in parliament. In contrast, Tsogtgerel’s western calendar demonstrated a young, savvy, and entrepreneuring capitalist with connections in domestic and international business spheres. Ultimately on Election Day the citizens of Uvs, like the rest of Mongolia, overwhelmingly elected MPP over DP candidates. During our Uvs visit we were interested in material things that candidates distributed to people, but we also wanted to investigate rumours of cash handouts. Most of the times when we asked about cash handouts, our interlocutors showed reserve and alarm because such activities are considered illegal by the electoral law. Although responses were vague about receiving cash, people had strong convictions about cash gifts. Based on experiences during the 2012 parliamentary elections, we were told that candidates usually distribute cash in the last days of campaigning within the legally allotted 18 days. One young man admitted that he received cash and did not feel ashamed about it. He believed he was entitled to the money: “If it is offered, one should take it” (Ogoh l heregtei, ogch baigaa bol avah heregtei shu dee). Whereas things like calendars and processed noodles were subsumed into the daily activities of people and appeared to symbolize patronage by powerful and wealthy elites, campaign cash handouts appeared to be something to be claimed, not just passively received. Moreover, the illicit discourse on cash handouts had a moral implication in a time of crisis and national debt – a topic that we will examine in a forthcoming journal article and project workshop at the National University of Mongolia on November 15th, 2016. When we asked people what party they planned to support in the June election, we heard nearly the same thing over and over in rural areas: “I’m voting for the person, not the party” (Nam geheesee iluu huniig ni songovol uul ni). While the unprecedented number of independent and third-party candidates may have contributed to this attitude, the highly individualistic campaign strategies of candidates certainly nurtured a politics of persona. Our research in Uvs suggests that gifts also serve citizens, and this is why they are readily accepted. Beyond the usefulness of things like calendars and noodles, the receipt of gifts during the pre-election period is a means for Mongolians to gain visibility as citizens. In contrast, after the elections everyone expects that politicians will lose interest in them and do only what matters for themselves, their businesses, and their factions. The political parties publicly nominated candidates for jurisdictions on May 28, 2016. Их Өр Үүссэн, Дууссан Түүх, Б.Пүрэвсүрэн, 2008, Улаанбаатар хот. Hurelbaatar was re-elected into Parliament. An earlier version of this blog, posted on August 31st, mistakenly wrote that Hurelbaatar did not receive his party’s nomination. Uvs is a longtime MPP stronghold in Mongolia.